One problem everyone faces when dating is how to figure out what you want. Every date gets you one step closer to understanding what kind of person you are most happy with. Wouldn't it be nice, however, if there were things you could do to eliminate dates that will never work? Then you can avoid going out on them entirely and only focus on dates which have potential. Our relationship expert says you can know what you want, but you have to start by "deserving what you want." Scot McKay, along with his wife Emily, are founders of X&Y Communications. After a successful career in Networking/Telecommunications, Scot realized what made him happiest was helping people. At the same time, a divorce left Scot wondering how he could avoid having his next marriage fail as well. So, Scot began his quest to become the best man he could be and in the process, attempt to understand women. His methods worked as he began having a "wildly successful dating life" despite being a fairly average guy. Soon men were requesting that he share his secrets so they could be successful as well. What started as a newsletter sent to friends later became a book, Deserve What You Want, a marriage to Emily, and the X&Y Communications Website. LoveToKnow is happy to have the opportunity to present this interview so you can find happiness just like Scot. What advice do you have for the question: How to figure out what you want? The first step is to become a great man or woman of strong character who reflects the ability to be one-half of what you already consider to be a great relationship. There is no "quick fix" here. Everyone has his or her own path, and you have to start with your idea of a "great relationship" as is. That's always better than status quo. Then, you start dating as many people as your schedule will allow. If you find it difficult to attract anyone, then the reality is you've got to go back to the deserving stage. Becoming a person who deserves a great partner is not necessarily a finite process, but there's definitely a "critical mass" point where one begins to notice a clear increase in one's own ability to attract. As you go on dates with different people, you'll see patterns in terms of what you really appreciate about people you find yourself attracted to. You'll also get more practice at identifying and avoiding those who represent trouble. And because you have options, you let go of those potentially poisonous people more often. You know, interestingly I often find that people who are starting to feel they deserve a great partner soon develop a stereotypical "checklist" of traits they want. Such a checklist contains all the media-driven ideals along with all the recommendations your mother made. Then, as those people date more and more they figure out that what they are really attracted to is very different from what they initially thought. Along the way, something magical happens: The process comes full circle and a person one day realizes that he or she WANTS is exactly the person he or she DESERVES. That's the baseline premise behind what we call "perfect imperfection" around here. It says on your Website that you met your wife, Emily, online. What techniques did you use to evaluate her profile and decide that she was worth pursuing? I really love how you worded this question. So many guys in particular treat online dating as a "numbers game" whereby you "cut and paste" the same lame email over and over to as many women as you can, hoping to get a "bite" somewhere along the way. That to me is a fast track to "settling", which is a concept we talk about a lot. After having worked through how to succeed at online dating, I had reached the point where I was very selective. Knowing that between 60-80% of the women I would write would respond I only chose to contact women whom I considered to be the very highest quality. I had learned to look for a positive outlook on life and particularly towards men in general, a friendly demeanor and for clear indications that she enjoyed having fun in life rather than sitting on the couch all the time. I also looked for a woman who enjoyed being feminine. Finally, and importantly, I looked for congruency between the pictures and the words, learning to trust one's gut instinct when evaluating online profiles is crucial. For example, if the friendliness is evident in the narrative, when I look at her pictures, I want to see that in her eyes. Generally, an authentic person's profile is virtually free of inconsistency. Interestingly, it seemed like every one of her pictures looked different…but I loved every one of them. So, I took that as a sign I'd likely not be disappointed in real life no matter which ones looked most like her. For the record, my favorite picture of her turned out to be the most accurate. When you and Emily got engaged, how did you know that she is what you deserved and what you wanted? When Emily and I first met, we mutually felt as if we had met "The One" shockingly fast. Nonetheless, I learned what I know these days about deciding whether to marry someone from a shampoo bottle: Lather. Rinse. Repeat. I made sure Emily and I spent lots of time together in various situations and under almost every circumstance I could think of. Then, when I felt like we were truly compatible, we did it all over again. For example, about a month after we met I took her on a five-day road trip where we purposely were in the car a long time together and never separated. Five months after that, we went on another one. She thought I was going to propose to her during that second trip, but really I was still going through a crucial part of the process. We certainly did get engaged shortly thereafter, however. The quote on your Myspace page says "Never, Ever Settle…Ever Again." Why do you think people settle for something less in relationships? Ultimately, it comes down to the simple fact that most people don't feel they have options. A guy walks into a bar and hits on 8-10 women. Woman #10 agrees to go out with him. He's thrilled that she's actually interested. They go out and start hanging out quite a bit because both now feel they have "found someone" to ease the pain of loneliness. A month later the woman says, "So are you going to make me your girlfriend? If not, I'm going to walk." The guy agrees…after all he doesn't want to have to go out and meet someone else all over again. Deep down, she doesn't either. Another six months go by, and they are engaged. A year later the guy wakes up married to a woman he didn't even really choose. He and she have both "settled". "Settling" of course is a danger for both men and women; my example is but an illustration. Notably, even if one partner really, truly is crazy about the other, if that other partner is indifferent then they are both actually settling, aren't they? When people are in a relationship, they both should be there by choice rather than by default. You can only get there by doing what it takes to deserve what you want and then finding that person. The only alternative is to "settle"…and millions do. Not having dating options-or automatically assuming you don't-is what invariably lands those millions of people in that position. What do you think men and women most want out of relationship? Ultimately, we all want someone in our life with which we can share a more fulfilling life in every way than we could have achieved alone. That's the yardstick. LoveToKnow Dating would like to thank Scot McKay for taking the time to do this interview. When determining how to figure out what you want, practicing the advice given by Scot is a great place to start. 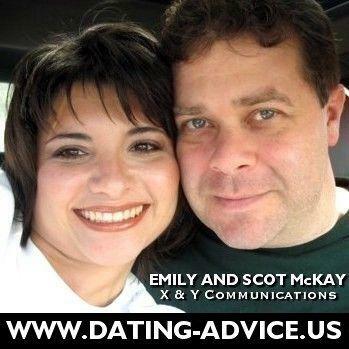 For more information about X&Y Communications and the services that Scot and Emily offer, visit dating-advice.us.